Despite defeat, Tony ‘The Snake’ Pace has said he’s proud of his performance against former British champion Lenny Daws on Saturday night. Talbot Green’s Pace was offered the fight on late notice and enjoyed a good start to the bout, winning the opening rounds before being pegged back by Daws and referee Ian John Lewis scored the six rounder 58-56 in favour of Daws. Pace has no regrets and says he didn’t think twice about travelling to take the opportunity in Kent on Mick Hennessy show where he did his best to make the most of the opportunity. He said, “I’ve got no regrets at all, you win some and some you don’t. 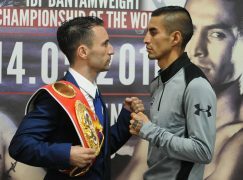 It was a good fight, I was straight at it and won the first two rounds then the third round was very close. If I had got the benefit there then I would have had a draw and that would have been brilliant for me. “Before the fight I said Daws had the best pedigree out of the fighters I’d faced but I wouldn’t say he was the best. His style suited mine and like I say, if you score the third round differently then I would have got a draw.” Daws, who controversially lost out in a European title bid in June, commented after the fight that he could have stopped Pace if the fight went a few more rounds but it’s a notion that Pace disagrees with, strongly. He said, “I wasn’t ready to go at all, it would have suited me if the fight was longer because I would have got my second wind. I saw him after the fight and he was all marked up but I didn’t have a scratch on me. He can have a rematch to prove it if he wants. “He was able to just out-jab me in the last few rounds and that was the only difference. If it wasn’t for me stepping in late then he wouldn’t have had a fight on the show, so he should appreciate that.” There are no concrete plans for Pace’s next outing but he’s eager to return to the ring as soon as possible and that could be before Christmas. 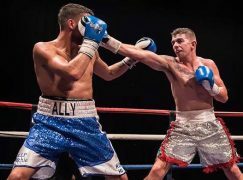 One fight that does interest Pace is a challenge to Welsh light-welterweight champion Jason Cook and that could be feasible for Matchroom Sport’s February 1st show in Cardiff. Remaining tight lipped, he said, “The Jason Cook fight would definitely interest me, he’s had a great career and I respect him. I’ve always wanted to be Welsh champion though and if we could get the fight on in the new year then I’ll take it.” Cook took the title in November 2010 with a body shot stoppage over Barrie Jones and he’s yet to defend it, while Pace has challenged for a Welsh title at lightweight in February of this year which ended in defeat and resulted in a move up in weight.